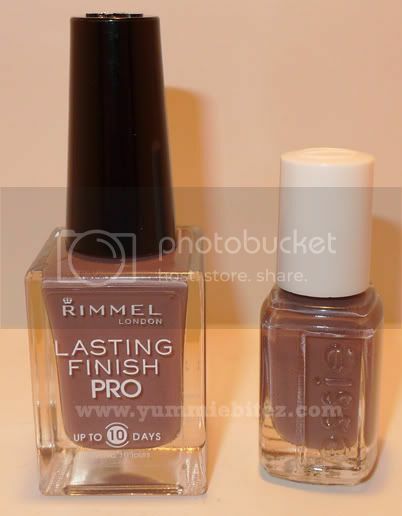 During my most recent haul post/video to CVS, I randomly picked up this Rimmel London nail polish. I've been loving neutral colors lately and this bottle has definitely struck my interest. 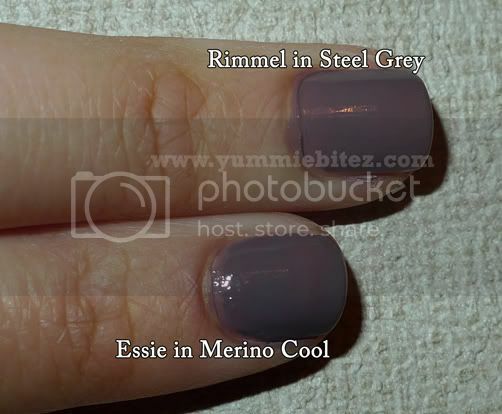 Rimmel London's Steel Grey (270) can be described as a grey base nail polish with a slight purple tinge to it. The purple tinge is more visible during the daylight or when it photographs using flash. 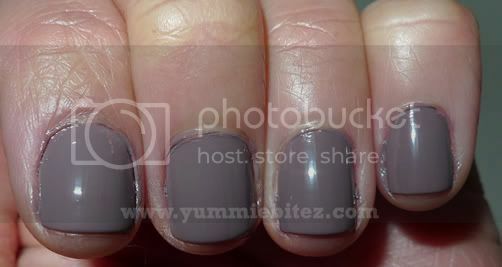 However, in low-light settings, the nail polish can almost appear like a taupey grey color. And this particular shade makes a great fall or winter color. What I really like about this nail polish is the brush. I'm not exactly an expert in nail polish application nor am I ambidextrous. So, when it comes to painting my right hand, it starts to become all sorts of mess since my left hand is not my dominant hand. 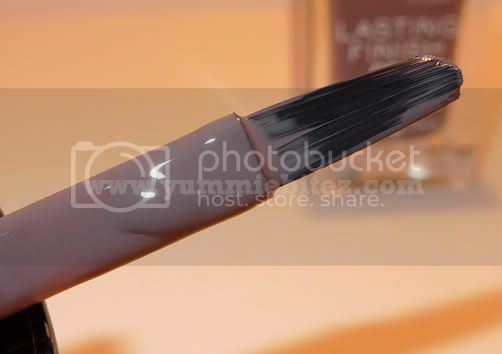 But with Rimmel's Lasting Nail Polish wand, application was a cinch. It almost didn't require me to clean up the sides of my nails or my nailbed. And that is pretty rare! I'm not one to color inside my nails usually, but the shape and the stiffness of the brush really made it easy for me to apply the nail polish. The brush is flat and slightly stiff with a curbed end which helps control your application especially for people with the not-so-steady-hands. The nail polish has a creamy finish and it wasn't streaky or goopy when you apply it on your nails. Even with one coat, it gave me a semi-opaque coat, but two coats seals the deal. Also, the nail polish dried up fairly quickly even without a fast-drying top coat which is a plus for me since I'm one of those impatient people who can't stand waiting for nail polish to dry. As far as it's lasting power, sadly, this polish will not last you up to 10 days as it claims. In order to test this, I applied the nail polish without any base or top coat. 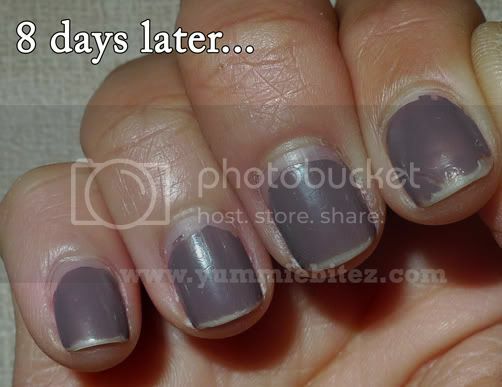 If you look to the image down below, my manicure has been pretty beat up badly. It's pretty embarrassing that I've even allowed my nail polish to look like this. I'm usually on the computer for the most part when I'm at work as well as when I go home to blog. So my nails are always in contact with the keyboard as the chipping shows on the tip of my fingers. I started to notice minor chipping around day three or four. I was hoping that the nail polish would have lasted 10 days because then it will make the perfect nail polish for me. But, this nail polish is still pretty good for it's value especially with the stiff, flat, and rounded brush that it uses. And the staying power can easily be fixed by applying a top nail coat to make it last longer. And I also noticed that this particular shade looks similar to what I already have. 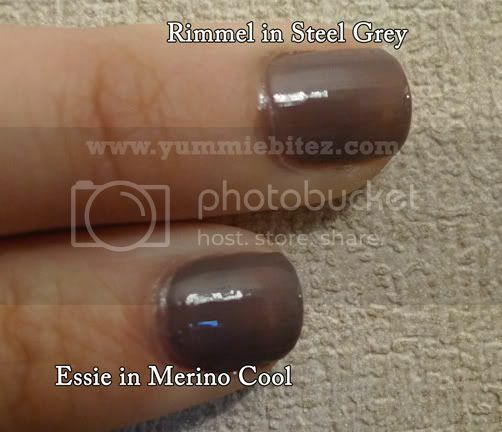 So I dig through my small nail polish collection, and what do you know, it's a good dupe for Essie's Merino Cool from the Fall 2010 Collection. 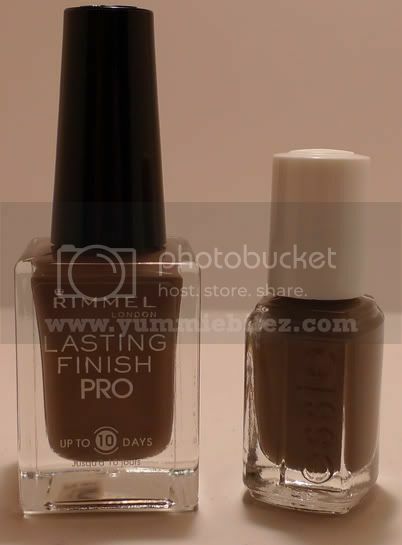 The only difference that I noticed when I was comparing them was that Essie's formula was thicker than Rimmel's. Other than that it's a good match. 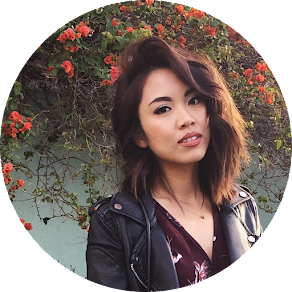 So if you missed out on that collection from Essie, at least you know there is still hope and there's a dupe that's available at your nearest drugstore. FTC: The product featured on this post was purchase with my own money. I am not affiliated or sponsored by the brand company. Views expressed on this post are my own and honest opinions. 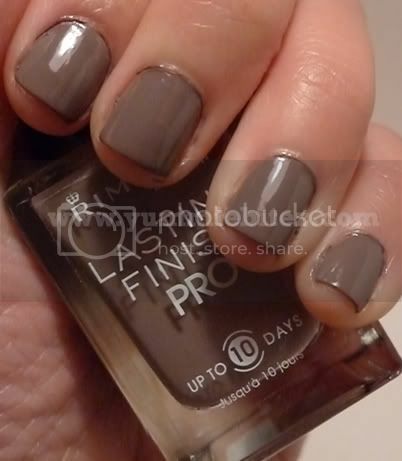 The color is gorgeous and the dupe is almost an exact match! Great post! Steel grey is my go-to color for my nails! great detailed review! The new cleans are ideal for the two fingernails and toes, and furthermore look incredible with changed outfit styles, for example, works of art and in vogue adornments.